Facebook got some bad publicity after the 2016 election when people realized that Russians and other bad actors used its ad platform to mislead voters. One reason this activity went undetected is that buying political ads on Facebook was completely opaque. No one could see the ads except for the specific people who were targeted. 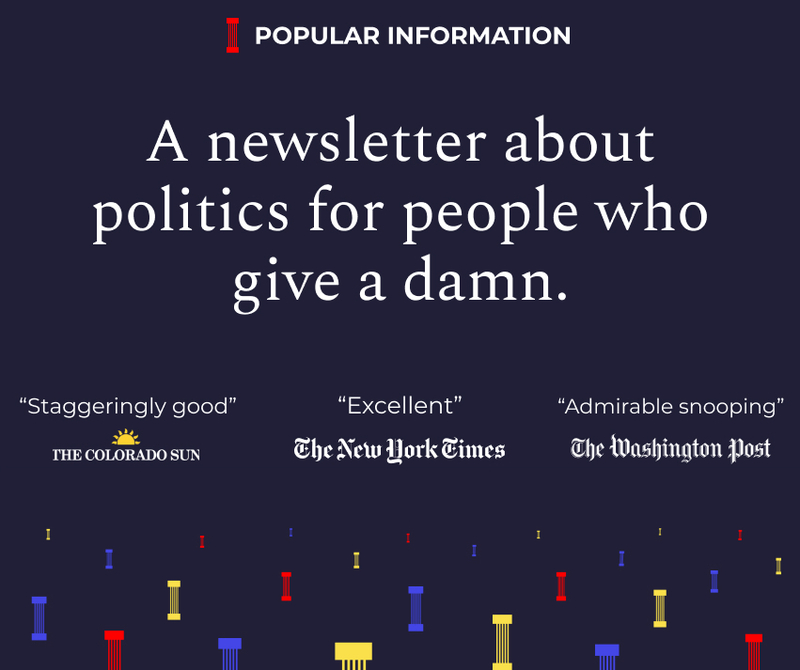 In May 2018, Facebook took a small step to provide some transparency; it created a database of all political ads on its platform. Facebook also now requires disclosure of who is paying for ads. As a result, for the first time ever, we can now see what the Trump campaign is doing on Facebook. This isn't a small thing. The man responsible for their 2016 Facebook strategy, Brad Parscale, is now the campaign manager. The Trump campaign doesn't just produce a single Melania birthday ad and move on. I counted 217 variations of the ad before I got bored. The ads are displayed in the Facebook library in rows of three, so you need to scroll through page after page after page to get to anything else. But once you get past the Melania ads, things get interesting. 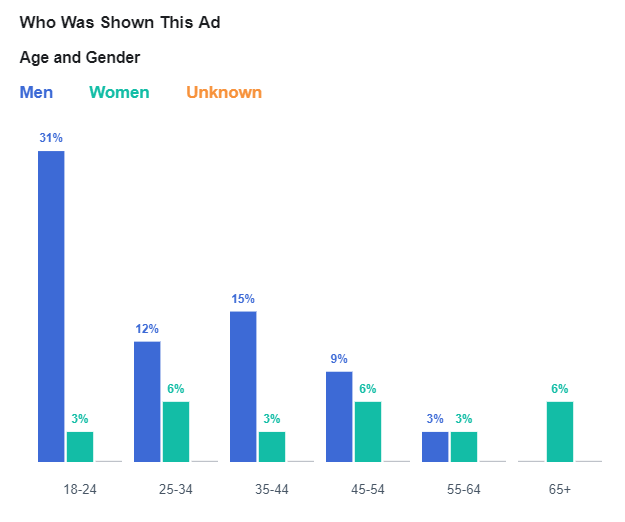 The Trump campaign has been deploying highly deceptive and manipulative ads on Facebook to target key demographics for the 2020 campaign. Another major set of recent Facebook ads by the Trump campaign features testimonials from several Trump supporters. Notably, none of these testimonials are from white men, where Trump gets the overwhelming majority of his support. They come exclusively from women and minorities. One ad features "Howard from New Mexico." As soft music plays, Howard says, "Sir, you have really inspired me and brought back my faith in this great nation. 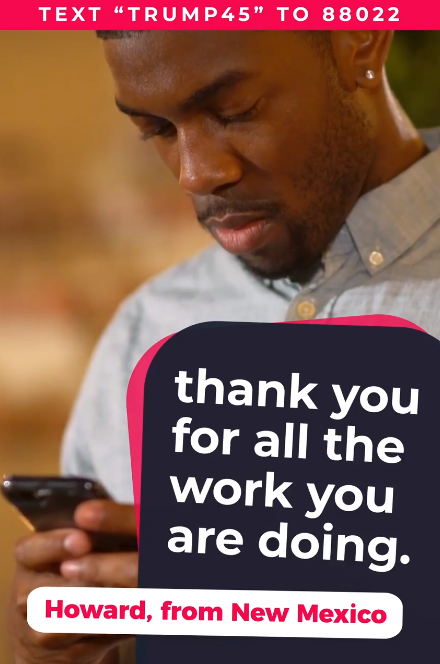 From the bottom of my heart, thank you for all the work you are doing." A video depicts an older African-American man smiling broadly. Except that the man pictured is not Howard. How do I know? 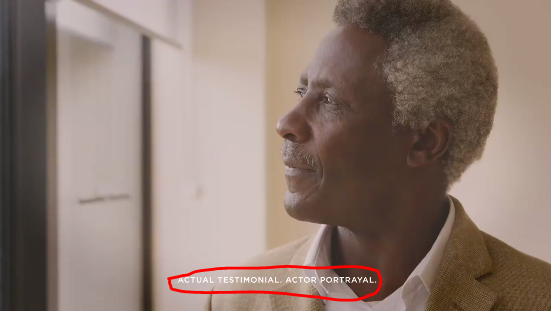 For a split second at the beginning of the video, in tiny print, the ad includes the following disclaimer: "Actual Testimonial. Actor Portrayal." 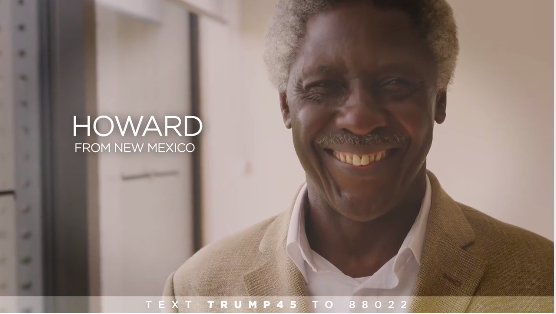 Giving the Trump campaign the benefit of the doubt, perhaps Howard really is an older African-American man and the campaign just hired the actor for purposes of the ad? That is unusual but not unethical. But in many other versions of the ad, Howard is portrayed as a young African-American man engrossed in his cell phone. 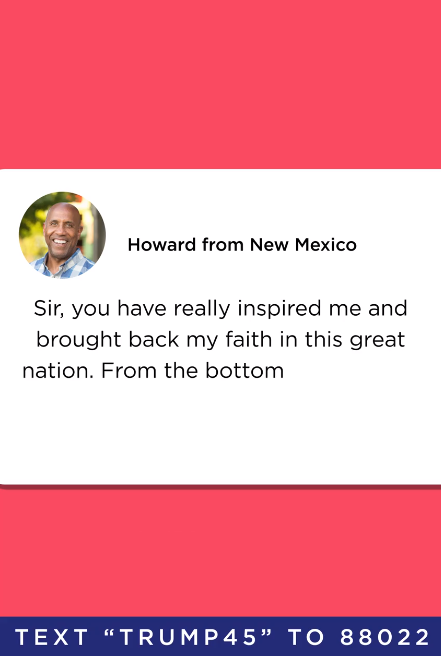 Howard is still from New Mexico and still has the exact same quote about Trump. The power of Facebook is its ability to micro-target audiences. Facebook vacuums up as much data as possible and then sells the ability to target its users on every imaginable attribute. The Trump campaign is taking full advantage of this. That is why there are so many versions of every ad. 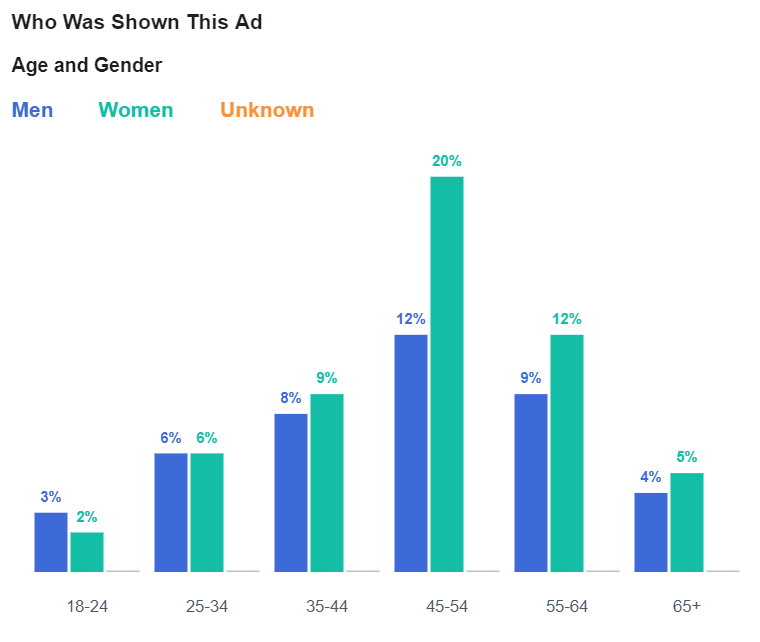 The Facebook ad library only provides the most basic targeting information, but it is enough to expose the campaign's strategy with Howard. 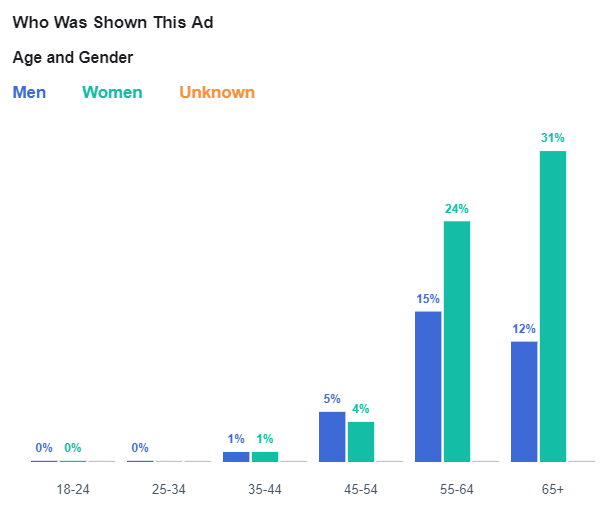 This is the targeting by age and gender for a version of the ad featuring the "young Howard." You can see that the ad is focused on reaching young men. 58% of the people reached were men under 45, and 31% were 18-24. 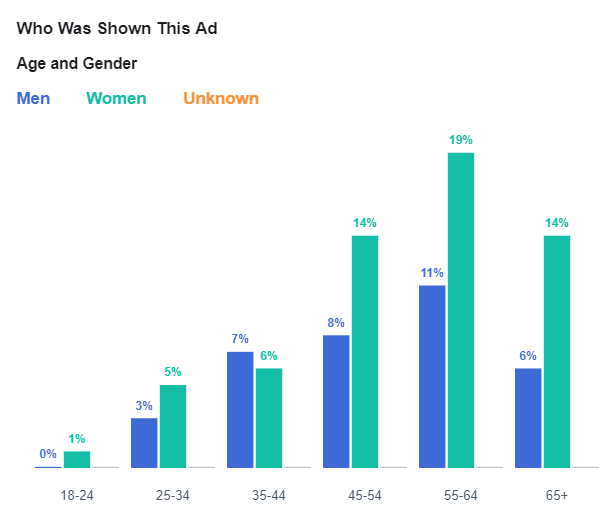 Now, look at the targeting by age and gender for the ad featuring "old Howard." Here, 55% of the audience is women 55 and older. The ad didn't reach any young males at all. It's unclear whether Howard is an African-American male or if he even exists. But we know that Howard is not simultaneously a senior citizen and a young man. The Trump campaign is dishonestly giving Howard multiple personas to exploit Facebook's microtargeting ability. The Trump campaign, however, doesn't leave anything to chance. There is also a middle-aged Howard. Most of the testimonials feature women, a group that is trending strongly away from Trump. The campaign is also using multiple personas of these women to take advantage of Facebook's ability to micro-target. One testimonial is from "Nancy from Nevada." In a video, a visibly gray Nancy says, "You're doing a wonderful job! Our border is a very serious matter. Stay strong & build the barrier. Thanks!" This ad is targeted to older women, including a significant number over 65. 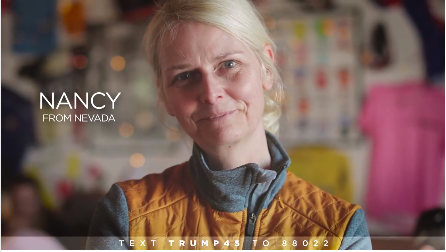 Another version of the ad shows a much younger "Nancy from Nevada" delivering the same endorsement. That ad is targeted at a younger demographic. Trump is also running other kinds of more traditionally misleading political ads. 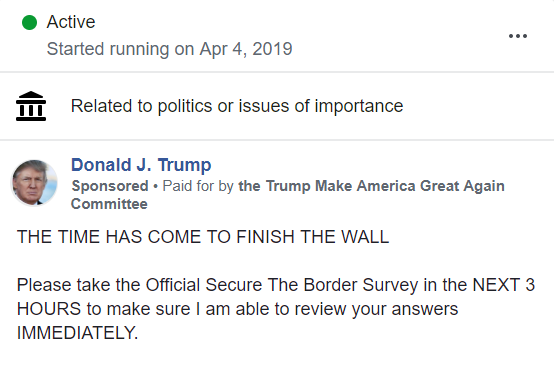 For example, one recent ad includes the following message from Trump: "Please take the Official Secure The Border Survey in the NEXT 3 HOURS to make sure I am able to review your answers IMMEDIATELY." But the ad has been running continuously for a week. 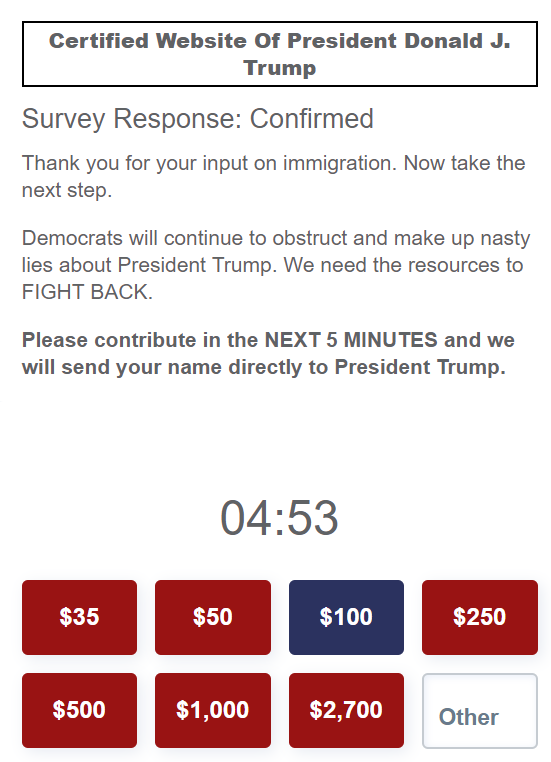 If you actually fill out the survey, it then says your answers will be sent to Trump if you donate to his campaign within five minutes. Spoiler: No matter what, Trump is not going to review your message. But Facebook allows the Trump campaign to target people who think he will. Facebook's ad policy prohibits ads that "contain deceptive, false, or misleading content, including deceptive claims, offers, or methods" but it is unclear how or if this rule is enforced. It's concerning that the Trump campaign is actively using Facebook to mislead and manipulate voters. Prior to the 2016 election, things were even uglier, according to a contemporaneous report in Bloomberg. “We have three major voter suppression operations under way,” says a senior [Trump campaign] official. They’re aimed at three groups Clinton needs to win overwhelmingly: idealistic white liberals, young women, and African Americans. Trump’s invocation at the debate of Clinton’s WikiLeaks e-mails and support for the Trans-Pacific Partnership was designed to turn off Sanders supporters. The parade of women who say they were sexually assaulted by Bill Clinton and harassed or threatened by Hillary is meant to undermine her appeal to young women. And her 1996 suggestion that some African American males are “super predators” is the basis of a below-the-radar effort to discourage infrequent black voters from showing up at the polls—particularly in Florida. The Trump campaign used Facebook and other low-profile communications channels, like ethnic radio, to pursue these objectives. This time, any Facebook ads designed to suppress votes would appear in the ad library. But would it make any difference? Any such ads could be easily obscured by thousands of traditional ads the Trump campaign will produce daily. If someone does happen to notice, will anyone care? $11,118,788 on Facebook ads in the last 11 months -- spending that is sure to increase dramatically over the next two years. Good info. Thanks for sharing this article.